Rules and procedures are key features for a modern organization to function. It is no surprise to see them to be paramount in safety management. As some sociologists argue, routine and rule following is not always socially resented. It can bring people comfort and reduce anxieties of newness and uncertainty. Facing constant unexpected events entails fatigue and exhaustion. There is also no doubt that proceduralization and documented activities have brought progress, avoided recurrent mistakes and allowed for 'best practices' to be adopted. However, it seems that the exclusive and intensive use of procedures today is in fact a threat to new progress in safety. There is an urgent need to consider this issue because there is doubt that the path chosen by many hazardous industries and activities is the most effective, safety wise, considering the safety level achieved today. 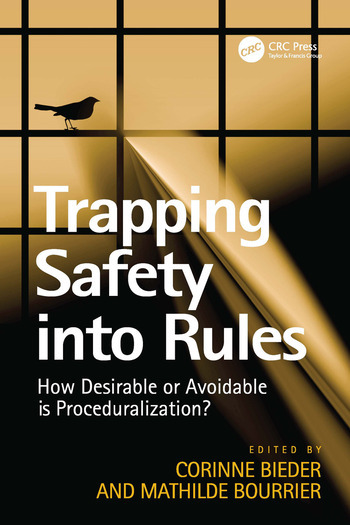 As soon as safety is involved, there seems to be an irresistible push towards a wider scope of norms, procedures and processes, whatever the context implied. This book is not a plea against proceduralization, but it does take the view that it is time to reassess how far it can still go and to what benefit. Underlying these questions, there is a growing suspicion that the path taken might in fact lead to a dead end, unless the concept of procedure and the conditions under which these procedures are developed are revisited.